I don't really know what to expect...but I am super excited;D I can hardly wait to come home from work to watch my lesson one video. I hope you had a great weekend. I found this new organic grocery store called Fresh and Easy, it is really a nice place to shop (it is kind of like a Trader Joe's/Whole Foods store). I wasn't able to get everything on my list, but the things I did get were really fresh. I also had to go to the Apple store to get another battery for my mac book (this is my third one). I am glad they have such great customer service;D And there was a Jon & Kate Plus Eight marathon on TLC yesterday. Ashley and I watched quite a few episodes (love that show!). As always the weekend just flew by. Today's card I made for one of my SU! customers (I am mostly a hobby demo), but whenever anyone places an order with me, I like to send them a card with their invoice/order. I had seen several cards using the square punch on Splitcoast Stampers last week, and decided to give one a try. 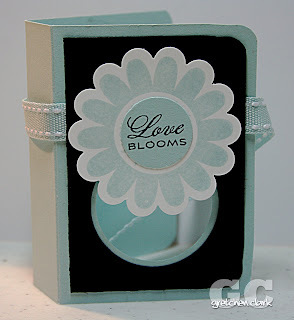 I was contacted by beccabatgirl (Becky) on Splitcoast Stampers to be apart of the gsg swap group which is by invitation only...I must say I was flattered to be invited and am excited to start stamping/swapping with all these talented gals! Hi all...are you getting ready for the weekend? I know I am. 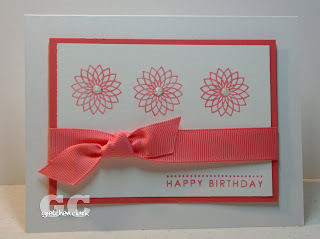 I actually had some stamping time yesterday...it was nice. I needed to make several cards and I am glad they all came together pretty fast. This one is for my aunt, who was just diagnosed with bladder/colon/lymph cancer. She is having a rough time with chemo and it makes her so sick that they have to stop it. I wanted to send her an encouraging word, and pulled out my Elegant Inspirations set. I used one of my favorite color combos, blue/brown, and was able to try out my new nestabilities. If you think of it today please say a prayer for my aunt Karlene:D...thanks! Last night Ashley made Monkey Munch (that is what we call it), it is so good and I ate way too much. It is really easy to make, but I am glad she only makes it once in a while! So Ashley and I have been talking about re-useable grocery/shopping bags. I don't know about you, but I hate those plastic ones you get at the grocery store...and to top it off...they only put 2 things in them so you have 50 bags to carry into the house. I also like the idea of doing my part to help with waste;D We both bought a set of these I am anxious for them to arrive and try them out. They are supposed to hold two times the amount of one grocery bag. I will let you know how we make out with them. Hopefully I remember to take them with me on my shopping trips. I hope your day is Awesome! Thanks for stopping by!!! Another busy weekend! I have been on an organizing kick for a few days now (which is a good thing). I guess spring didn't get me into the cleaning mood...No, I wait until summer when it is stinkin' hot! lol! I have been on an organizing roll and it feels good to get stuff back in it's spot/weeded out. It just makes me happy to have everything put away and organized (I think I may have a control issue, lol!). Mike and I enjoyed swimming on Saturday morning (92 degree water...glorious), went out to eat for lunch at Chipolte, ran some errands and then I put him (and me)to work organizing our computer/my craft room (my side was pretty much clean). I must say that it looks Marvelous! I hope it stays that way for a little while, I even got all our shredding done...that stuff always piles up, I have a basket on top of the shredder and it was full (I hate junk mail). Have a Marvelous Monday! Thanks for visiting!! I am so glad it is Friday! 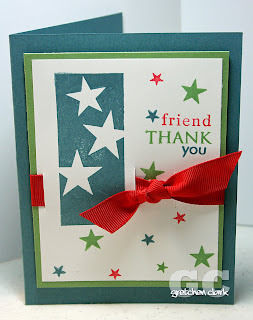 I am planning to get some stamping/digi time in this weekend...I must get some thank you cards cranked out! 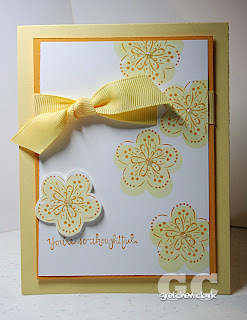 And I want to get the new kit by Shabby Miss Jenn, see it here. Isn't it nice? Too bad I don't have any beach pictures to scrap...being that I live in AZ, lol! 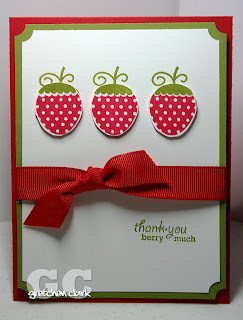 Today I am posting another oldie but goodie card. This is one of my favorite sets...I love this dress image. It is hard to see from the picture, but I cut out the dress and popped it up with a dimensional. FYI: SU! 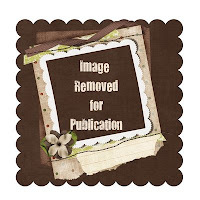 announced this week that they are going to be carrying a new product line...Wall Art. I am not to familiar with it, but they kinda look like a giant rub-on for your walls. I am hoping that they work on textured walls (if anyone knows...leave a comment). I think I may put one in my craft room...they have a large Create one that would look neat in there. 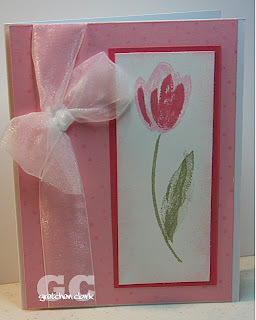 Here is a card I made a while ago...this set (Terrific Tulips), was one of my very first (and favorite) SU! sets. I had never done two-step stamping before, and I thought it was really cool! I was sad to see this set retire a couple of catty's ago...but you have to make room for the new and improved...I guess. 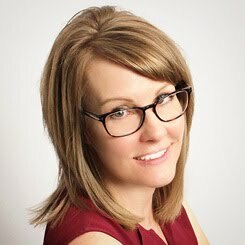 If you are interested in learning how to organize all your digi supplies/pictures on your computer, then head over to Jessica Sprague's website here...Sign up's are today to learn the programs ACDSee (for Windows) and Shoebox (Mac users)...I have the ACDSee program and really love it!!! I am all over anything that organizes and makes your life easier. Once you start acquiring all sorts of digi kits/pictures, you start to forget where the cute button, the polka dotted paper or the picture of the cat you are looking for is...this way you tag all your items by category...just click buttons and viola' all your buttons, polka dotted paper and kitty pic's are there for you...it just makes me happy! Have a great Tuesday!!! Thanks for visiting today! Enjoy! And thanks for visiting!!! 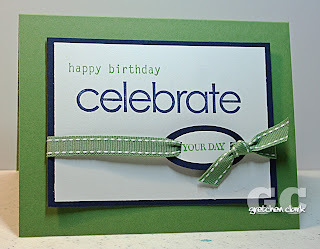 One trick that I use is this: instead of wrapping the ribbon around the card and tying it that way, I lay the ribbon across the front and leave about an inch on each side; then I tape it to the back of the card; cut another piece of ribbon for the bow/knot; tie (I ususally fiddle around with the ribbon until the knot looks the way I like it). 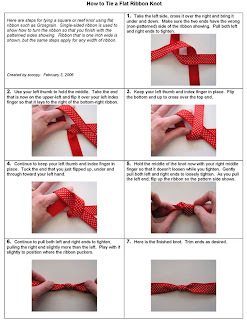 I find that this way I have a lot more control over the bow/knot and I save ribbon in the long run. I hope this helps...please feel free to email or leave a comment if you have any other questions on ribbon tying. Have a super day and thanks for visiting my blog!!! 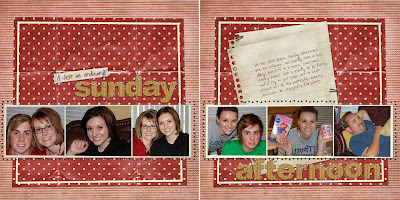 I had a very productive day off yesterday...I was working on Ashley's wedding invitations. I think I have the fold/design down. Now I just have to order another set (or two) of Nestabilities to finish the design. Then I called all the local hotels for rates for our out of town guests to include with the invitation. It feels good to get some of that small stuff accomplished...because you know how things go...there is always something that you forgot or doesn't turn out right, so I want to have as much done as possible to be ready for the unexpected! 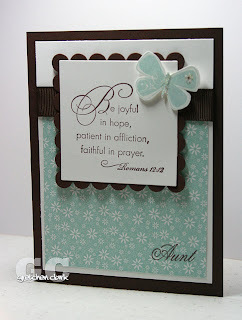 So I pretty much worked most of the day yesterday on Ashley's invitation design and did not get any other stamping in. And I cannot show you her invitation yet. I did however, have a few moments to update my desktop calendar. You can download this one for free here. 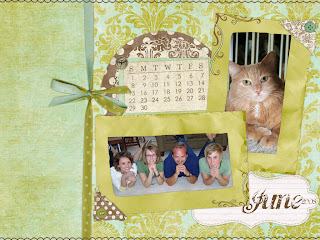 I didn't have time to be creative, so I just used our Christmas photo and then found a vertical one of our cat Peter. I hope you have a Terrific Tuesday and thanks for stopping by! *I have NOT forgotten about my bow/knot tutorial, it will hopefully be done this week...it has just been a little crazy around here lately! Boy, my weekend flew by! Although I did get lots accomplished. Mike and I worked out in the back yard on Saturday morning. Our area has bulk trash pick up on a quarterly basis and the pick ups start today...so we HAD to get all the trees and bushes trimmed so we could get them out for pick up. I wasn't really thinking and didn't put on sunscreen...and I got a really bad sunburn on my back...ouch! It is my own fault...because I know better! Saturday afternoon, Ashley, her maid of honor (Lindsay), and I met with the florist for her upcoming October 4th wedding...we should be getting the quote on Wednesday...hopefully not too bad! It went pretty smoothly...let's hope the $$ part works out. Sunday we had a church picnic and baptism party. It was a lot of fun, although it was HOT! 4 teenagers were baptized, which was really cool. We had lots of yummy food too! 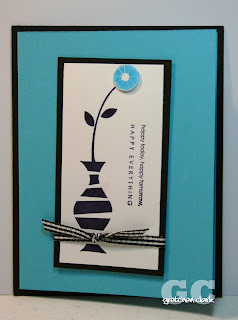 Today's card is really similar to one I made last week, I just changed the colors. 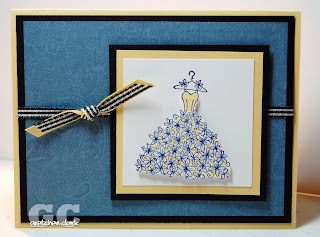 Sometimes when I need a card fast, I case a card I have already made. This one was for my Friend Jackie, she is 39 again this year, lol! I do have some projects to share...but didn't get them photographed and uploaded yet. Instead Ashley and I did some baking and caught up on a couple of shows on the DVR (Hell's Kitchen and Jon & Kate Plus 8). We had a great girls night (while Mike played his computer game). In large mixing bowl, cream butter and shortening, gradually add sugars beating until light and fluffy. Add egg; mix well. Combine flour, soda and salt; add to creamed mixture. Blend in extracts and pineapple juice. Stir in chips, coconut and nuts. Spread (I pressed with my hands) into a 10x15 baking sheet. Bake at 350 degrees for 20-22 minutes or until lightly browned. Cut into squares...Enjoy! *if you want to make cookies rather than bars: chill dough for about an hour; then drop by spoonfuls onto cookie sheet; bake at 350 degrees for 12-14 minutes. 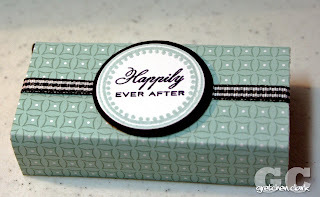 Here is another wedding favor...this one is a tic tac holder (I didn't have any tic tac's and wanted to take a picture before I gave it away...see previous posts for explanation). I cannot take credit for this cute little creation I found the template here I just used my color scheme and made it wedding themed. These are really cute little gifts and really easy to make. Okay are you ready for some randomness? I have a love for bowls (any kind) and plastic wear...so while I was sick last week, I watched a lot of television and saw a commercial for these I thought they were really cool!!! The lids snap to the bottom (so you never loose it), or they can all snap together. So while I was picking a few things up at the grocery store yesterday, I thought I would check them out. I ended up buying an 18 piece set. I am going to throw out all my old ones and reorganize! They are pretty cool (if you like that sort of thing). Have a Terrific day and thanks for stopping by!! Whew...I am finally back in the land of the living! I don't know what I had, but I am glad it is over!!! I had been sick from Wednesday thru Saturday...Yesterday was the first day I could actually eat regular food. I am so glad to leave the Saltines/Jello behind!!!! On the positive side...I think I may have lost 5 lbs. Now on to the stamping! Like I posted on Friday...a girl from my church needed some favor's for her work. She works for a hotel and they are handing out small favors at a bridal show. Here is a cute little nugget box. 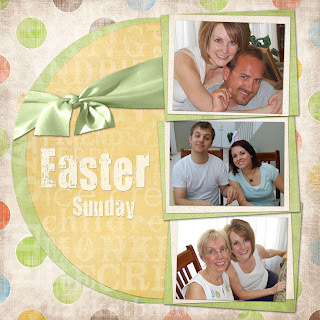 I made a bunch of these a couple of years ago...They hold 3 Hershey's Nuggets (you can find the template here). I kept with the same color scheme as the chocolate bar wrapper from here I pulled out some of my retired Wintergreen Designer paper for the outer box. A cute little gift of chocolate...gotta love that!